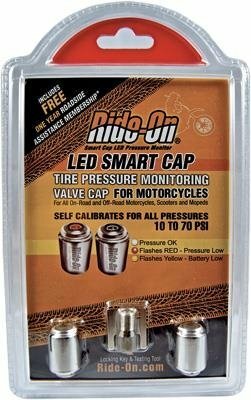 Ride-On LED Smart Caps are the easiest TPMS (Tire Pressure Monitoring System) to install on your tire valve stems. The LED Smart Caps automatically calibrate to the pressure in the tire and sets itself when the cap are installed. TPMS caps can be used with pressures from 10 psi to 70 psi. Automatically compensates for ambient temperature changes to avoid false alarms. Comes with integrated anti-theft device. Ride-On TPMS LED Smart Caps blink red to alert of low pressure for up to 750 hours. Low battery alarm - the LED Smart Caps will blink yellow for up to 100 hours to alert you that the batteries are running low. Uses standard watch batteries. Bright blinking LED light that is visible in daylight and night time.